Blessed is he, "Beatus Vir" says the page. This illustrated letter "B" depicts the process of the creation of a book. 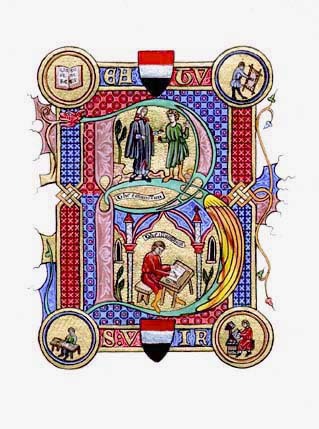 The bandorel (medieval scroll shaped "cartoon balloon") announces the commission being made in the upper loop of the "B." Then the four quarters starting on the top right and moving clockwise show: making the parchment, writing the pages, laying the gold, then in the lower loop of the "B" we find the illuminator hard at work. The final disk shows the completed book open to the signature: "RanthulfR Me Fecit."